An Edwardian bandstand commemorates the musicians lost in the "SS Titanic" disaster of 1912 . It was erected by the council with funds raised by the Victorian Band Association, citizens of the area and the Council. It is a memorial to the sinking of the Titanic, a disaster still recalled today, and to her heroic musicians who played as they went down with their ship. It commemorates the bandsmen who played sacred music (Nearer My God to Thee) on the deck of the "Titanic" as this liner slowly sank in the Gulf of St. Lawrence after a collision with an iceberg. The "Titanic" was the largest ship in the world and believed to be the safest ship afloat. Of approximately 2200 passengers there were 705 survivors. The bandstand was opened in the presence of a large crowd of bandsmen. 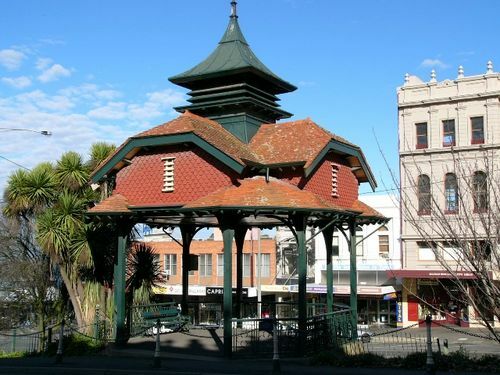 The bandsmen of Australia subscribed and are having a Titanic memorial band-stand erected in Ballarat. The memorial is to be unveiled by his Excellency the Governor-General on Friday, October 22. Bathurst Times (NSW), 13 September 1915. Arrangements in connection with the unveiling of the Titanic Memorial Bandstand have now been completed, and full particulars will appear in tomorrow's issue of "The Star." It will be remembered that as the vessel was sinking the band, with heroic fortitude, assembled on deck, and played the well known hymn, "Nearer my God to The." The massed bands will render this at the unveiling ceremony, which is a most fitting tribute, under the circumstances. The Ballarat City Orphanage, and other local bands will take part in the ceremony. Ballarat Star (Vic. ), 21 October 1915.